In this easy recipe, the herbs and vegetables are layered in a Dutch oven and cooked without stirring until the beans are soft and tender. The beans shouldn’t be crunchy, and must be cooked through. Adjust the amount of olive oil as desired. 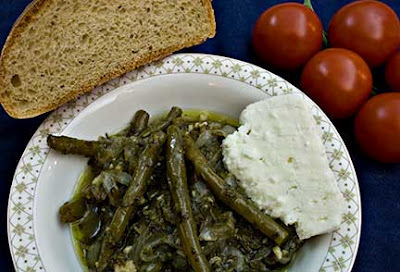 Serve with slices of feta cheese, Kalamata olives, bread, and lemon wedges. Wash the beans, break off both ends, and break them in half. Mix the herbs and garlic together.In a Dutch oven, layer 1 cup of onions on the bottom of the pan, top with 1/3 of the beans, then 1/3 of the herb mix, season with salt and freshly ground black pepper, and drizzle with 1/3 of the olive oil. Repeat. Repeat again but finish with the remaining cup of onions before drizzling with the last 1/3 of olive oil. Cover and cook over medium high heat until the pan lid is hot. As soon as the lid is hot, turn the heat down to low and simmer for 1 hour, or until the beans are very soft and tender. Stir in 1/4 cup lemon juice. Taste and add lemon juice, salt, or freshly ground black pepper, as needed. Serve hot or at room temperature.